There’s a long run coming this November, and I have a pretty good hunch about who’s going the distance that day. Sharon Chapman, like you a Mets fan and like you a reader of Faith and Fear in Flushing, is training for the New York City Marathon. It’s a long run, all right — 26.2 miles for those of you scoring at home. 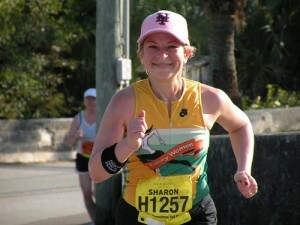 It’s a run with more than a dash of Met meaning, too, because of what Sharon’s doing while preparing. She is using this personally momentous occasion to raise money for the Tug McGraw Foundation, a group devoted to making the lives of people coping with brain cancer, post-traumatic stress disorder and trauma brain injury better. 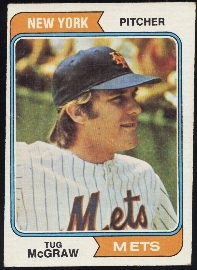 TMF was established as Tug himself — the man who originated the credo “You Gotta Believe” while closing out games for the 1973 National League Champion Mets — was fighting brain cancer. Tug, a Met stalwart from 1965 through 1974, died in January 2004. The Foundation continues to seek solutions to a deadly scourge in his name. 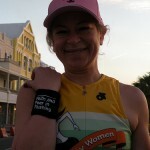 The intersection of Sharon Chapman’s marathon aspirations and the memory of Tug McGraw crosses our doorstep because Sharon reached out to us and asked if she could represent “Faith and Fear Nation” on her journey and wear a wristband with our blog logo. I didn’t even know we had a nation (maybe a dorm), but Jason and I said, sure, we’d be honored. 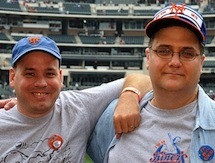 Since we’re unofficial sponsors, I thought it appropriate to check in with Sharon and find out a little more about how all this came together, how it’s progressing and get a greater sense for her fellow FAFIF readers why a Met legend, her Met fandom — and another Mets fan she has yet to meet — coalesced to make this more than just one woman running one race. I started running in the spring of 1999. I ran three times a week until the fall of 2008; at that time I had started Weight Watchers. Weight Watchers cajoled me into increasing my exercise by allowing me to exchange the earned Activity Points for Food Points, and as a result I started running virtually every day. How did your running progress from simple exercise to a try at the New York City Marathon? I blame Valerie Bertinelli. Seriously. Even though Valerie is a Jenny Craig spokesperson and I’m a Weight Watchers kind of girl, I attached to Valerie as my weight loss role model. She’s only slightly older than I am, she was looking to lose a similar amount of weight, and she wasn’t looking to become ultra-skinny; I could relate to her. To digress — I promise this comes together — in January 2008 I went to Bermuda and ran the 10K race as part of their International Race Weekend. Except I wasn’t prepared for Bermuda’s steep hills, and I couldn’t run the whole way. I was very disappointed to have done poorly in a race in Bermuda, which is my favorite place in the world. So flash forward to July 2009. My husband Kevin and I were in the car, and I told him that, now that I was at goal weight and in the best shape of my life, I wanted to return to Bermuda to get the 10K right. I also told him that I had no desire to run anything longer than 10K; I wasn’t interested in running a half marathon or anything like that. I ran that half marathon in Jersey City in September. At first, I thought that would be it. But then, the idea of running the New York Marathon started hitting me. When Kevin and I were in law school in Boston, I would watch the New York Marathon on television just to watch shots of New York because I was homesick. To go from wistfully watching the Marathon on television to actually running it is something I never imagined, and I realized that it’s something that I need to try. And I did go back to Bermuda this past January. Not only did I conquer the hills of Bermuda’s 10K race, but the next day — wearing my FAFIF wristband — I ran the half marathon there as well. By the way, Valerie Bertinelli is running the Boston Marathon this spring as her first full marathon. So I’m still working on keeping up with her. But if she ever decides to go for a triathlon, she’s on her own. What has the training been like to this point? What’s ahead? Initially, the training wasn’t all that different for what I’ve been doing since the Fall of 2008. I just kept running every day. But recently I started increasing my long runs, which also means I need to build a rest day and a cross training day into my schedule. I hit a wall during my first attempt to run 20 miles, so now I’m working on proper nutrition for long runs — making sure I’m eating breakfast on those days, finding out which gel packs I like best, adding electrolytes to the equation, etcetera. I’ve gone from being a recreational jogger to someone who is becoming more knowledgeable about running, which is a transformation I never anticipated going through. I started panicking about making the New York Marathon my first marathon, so I signed up for the New Jersey Marathon in May. I call it my training marathon; I can make all of my mistakes there so I’ll know what I’m doing in New York. The timing is good. I’ll have six months between the two races. That will give me two months to go back to easier running before I have to train again. You met and interviewed Tug McGraw once. What were the circumstances? As someone who grew up a Mets fan, watching Tug, describe that experience. I used to write a column called Fan’s Voice for New York Mets Inside Pitch. In early 2003, I had the opportunity to interview Tug by phone for the magazine. It was a great experience, and an instructive one. I was a novice, and Tug teased me about things like not recording the conversation. He was also very personable, entertaining and witty. The interview was basically everything one would ever expect from the man who coined the phrase “Ya Gotta Believe,” and it was a wonderful experience. The interview was published a couple of weeks before Tug’s diagnosis that he had a malignant brain tumor. I was absolutely shocked. In retrospect, there may have been two times in our interview that he didn’t have an answer off the top of his head, but for the most part he was sharp and on the ball. It was inconceivable to me that he could have been ill at the time we spoke. The postscript to this story is that my husband and I attended a Mets-Phillies game in the Phillies suite at Veterans Stadium in September of that year because we were involved in a local Cub Scouts group outing that season. I remember sitting down in my seat, looking over to the next section, and seeing a kid who looked like Tug McGraw’s son Matthew. At second glance, I noticed that it was indeed Matthew, and that Tug was sitting next to him. I went over and introduced myself in person to Tug, who remembered me and was very excited to meet me in person. That was one of the biggest thrills in my life. How did you find yourself involved with the Tug McGraw Foundation vis-à-vis the marathon? 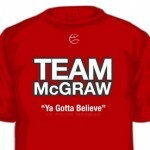 And what is Team McGraw? But back to your question. When I decided that I wanted to run the New York Marathon, I started researching how I could get in. One cannot count on getting in through the lottery, and I was never going to be fast enough to get in via a qualifying time, but I saw that one could get in by raising money for certain charities that had spaces in the Marathon. I remembered reading about Team McGraw from a Tug McGraw Foundation newsletter, and looked into that. It seemed to me to be the perfect fit; I could achieve my goal of running the New York City Marathon and help an organization that has meaning to me at the same time. Team McGraw is comprised of runners who participate in races to raise money for the Tug McGraw Foundation. It is headed up by musician Jeff McMahon, who is a distance runner himself and is also Tim McGraw’s keyboardist. The coach is Kevin Leathers, who’s given me some excellent distance running advice. Throughout the year different Team McGraw teams participate in races throughout the country. In fact, in addition to the NYC Marathon, I’m also participating in the NYC Half Marathon on March 21 as part of Team McGraw. Being able to run the Marathon with a support group is a very comforting feeling. I won’t have to worry about finding my way or figuring out certain things on my own. I’ll have a group of wonderful people guiding me and watching my back. Because, frankly, I’m a little scared about tackling this kind of a distance; having Team McGraw there to support me is making the concept of 26.2 miles much less daunting than it would otherwise be. You and I were both kids when Tug was traded to the Phillies. What do you remember most about Tug as a Met? Was he one of your favorites? I remember liking him. Everyone loved Tug, but I can’t remember too much about his Met playing career specifically. I do remember reading his Scroogie cartoon in the newspaper, though, and enjoying that very much. That’s the most specific memory of Tug from my childhood that I can muster. Does what you’re doing now give you a new perspective on Tug’s signature phrase? Ya Gotta Believe it does. That truly is a great motivating phrase. For that matter, it was also a motivator for my Weight Watchers success (I used whatever mind games I could in order to drop those forty pounds). 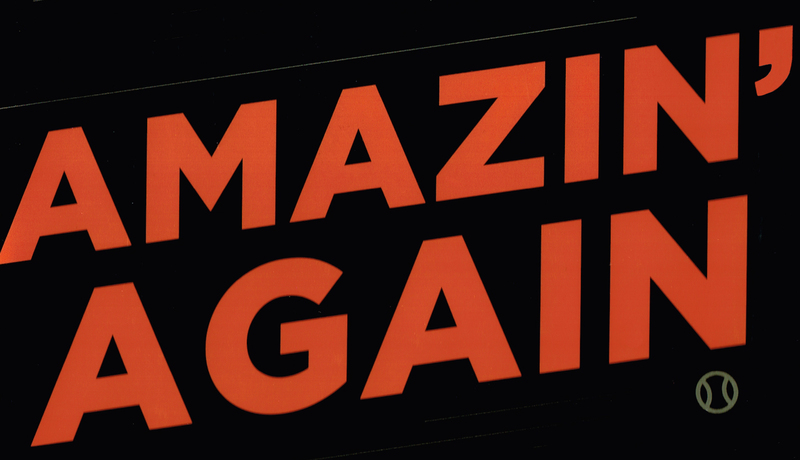 Whenever you need to give yourself a kick in the rear, Ya Gotta Believe is a great motivator. Tug spent roughly half his career with us, half with the Phillies, and he remained associated with them right up the time of his diagnosis with brain cancer. The Phillies are to be commended for having done a great job supporting the Foundation, no matter the rivalry that’s developed between the two clubs and their fans. Still, how odd is it for you to be wearing red in this context? It’s odd, for sure. But, as you said, understandable. Tug was a Spring Training coach for the Phillies when he got sick, and spent much of his final year living in the Philly area. For what it’s worth, while I don’t root for the Phillies, I do have to admit that the organization has always treated me very well. I live in Central New Jersey, and have attended many games in Philadelphia over the past several seasons. The Phillies have always treated me as a valued customer, which, sadly, I can’t say about my own team. Kevin and I will be attending the Tug McGraw Foundation Awareness Night in Philly on April 30, which will be during a Mets-Phillies game I’m hoping that by wearing my Team McGraw shirt that the Phillies Phans won’t give me too much abuse for wearing my Mets cap to the game. And how much blue do you hope to inject into the Foundation? I’m definitely hoping to inject some more blue into TMF. I think that a lot of the TMF personnel are simply unaware of just how evenly split Tug’s career was. Also, it’s to their benefit to court Mets fans, since we’re certainly at least as generous as the Phillies Phans! Everyone who knows me at the Tug McGraw Foundation knows that I’m a passionate Mets fan, and I think that’s a good first step toward getting TMF to be more aware of the fact that Mets fans are a resource they should be approaching more proactively. Could the Mets be doing more — or something — in this area? For sure! If the Phillies can do a Team McGraw Awareness Night, it seems like the Mets could do something similar. I’m not sure whether that kind of thing would be initiated by the TMF or the Mets, but someone should look into making that happen. Tug is a member of the Mets Hall of Fame. 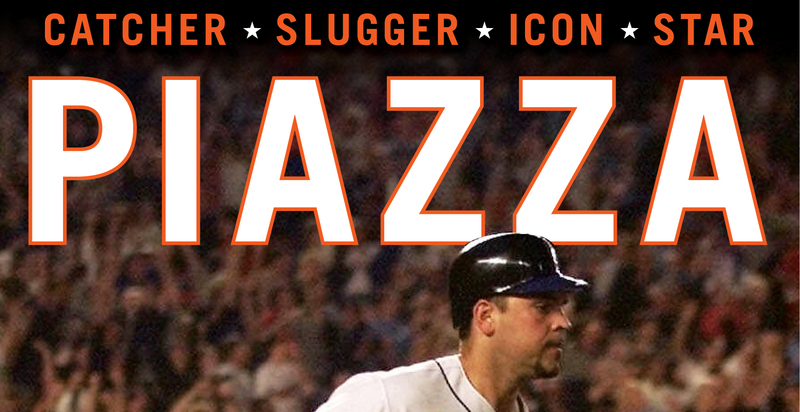 The team should definitely honor his memory by supporting the foundation that bears his name. Tell us a little about the young man you’re running for. We understand he’s a Mets fan, too. 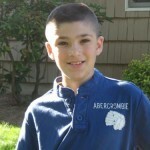 What does it mean to be “running for” twelve-year-old Connor McKean? Team McGraw asked whether they could pair me up to run on behalf of one of their members. Ultimately, they paired me up with Connor. I haven’t met Connor in person yet, but I have exchanged e-mails with his mom and I hope to meet them sometime this season. 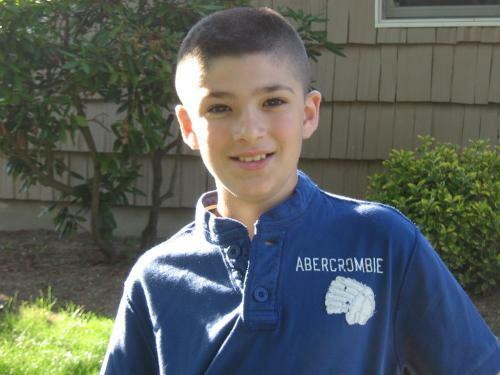 Connor was diagnosed with a rare brain tumor called an ependymoma on October 17, 2007. He still suffers from headaches, but is working hard to keep up in school. I chose to run for Connor after I heard that he only wanted to wear his David Wright jersey when he was undergoing chemotherapy. As the parents of two teenage boys and a girl in college, Connor McKean’s situation makes us really appreciate our own kids’ health all the more. It definitely makes running the Marathon for Connor McKean all the more poignant for me, because it could just as easily be one of my own kids going through the treatments and adjustments that he has gone through. What do you hope you will have accomplished by November after the funds have been raised and the finish line is crossed? Wow — I really haven’t thought in terms of the Big Picture much. So far I’ve been thinking about all of the small pictures leading up to November 7. For me, personally, I will have the satisfaction of having completed the New York City Marathon. I love this quote by Marathon founder Fred Lebow: “In running, it doesn’t matter whether you come in first, in the middle of the pack or last. You can say, ‘I have finished.’ There is a lot of satisfaction in that.” Since I was never blessed with speed, even as a youngster, I definitely hold this thought dearly. Obviously I want to raise as much money for the TMF as possible. They are a great organization, and I want to support them. 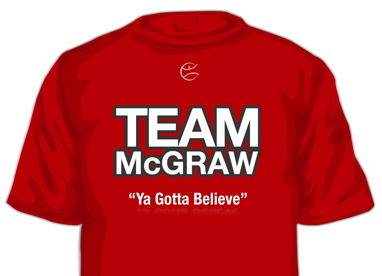 Even after my retirement from long runs, I hope to be able to help support Team McGraw in the future. I love the concept that I can be the poster child for the idea that anyone can run. Two years ago I was forty pounds overweight and had never run longer than a slow 10K before. If I can run a marathon, then anyone with enough desire and dedication can do it. If that can help motivate other people to strive for things they previously thought were out of reach — just like Tug and Valerie have helped motivate me to strive to lose weight and run marathons — that would be an incredible thing. You’re about two-thirds of the way to your fundraising goal. What does it mean to you to have elicited so much support from so many different people? It’s very touching to have received so much support from so many people. Obviously some of it is the result of having picked the right charity to run for — so many people love Tug and want to honor his memory. But it also means a lot that people are supporting me as well. It gives me extra motivation to train seriously for this, because I don’t want to let down all of these generous people! Finally, the wristband and “Faith and Fear Nation” was all your idea. We’re honored to come along for the run, so to speak, and talk it up, but why us? Why not you? Well, as you pointed out in “The Wrist of the Story,” I did get the idea from Stephen Colbert and his Colbert Nation. Since I know you’re a fan of The Colbert Report, I figured you’d appreciate the reference. Plus we had discussed the fact that you and Jason would help publicize my fundraising efforts throughout the baseball season, which is something I appreciate very much. It dawned on me that the wristband would be a nice way for me to thank you guys for your support. Plus, again, running for the Faith and Fear Nation provides me with even more incentive to take my training seriously so I can finish the Marathon and earn that medal! If you would like to support Sharon Chapman’s efforts on behalf of the Tug McGraw Foundation, please visit her fundraising page. Any and all contributions are greatly appreciated. 33 comments to What Makes Sharon Run? Go Sharon! You’re going to do great at the marathon, of that I have no doubt. Thank you Greg for your kind words, and thanks Greg and Jason for all of your support. I can’t tell you how much that means to me. Great interview! We are thrilled to have Sharon running with Team McGraw! She certainly embodies the “Ya Gotta Believe” spirit which drives the Tug McGraw Foundation. Great story. Plus the one thing FaFiF has been missing is pictures of Valerie Bertinelli; should become a regular feature. Once People magazine starts running pictures of Sergio Ferrer, I can see that happening. Mets Police – thank you SO much for running the story! Thank you for linking to the story! Go Sharon – Metsopotamia is behind you! Thanks so much for your story! Thanks – I appreciate you posting the article! Ya Gotta Believe…You’re a rock star! What a great article! Thanks for FAITH AND FEAR IN FLUSHING for supporting Sharon in her adventure with Team McGraw to the ING New York City Marathon; her passion is infectious and we are thrilled to have her as one of our dedicated team! We still have many months to go before we reach the starting line; I can’t wait to read more here about what is to come with Sharon and Team McGraw! Jeff – I didn’t see this until now.